We have already discussed common material Gucci uses, as well as a long 3-part post for an excellent Gucci serial number check. We now continue with this ‘Ultimate Gucci Guide‘ to tell if a Gucci bag is real (or fake) with another detail that needs your attention. When buying Gucci purses on Ebay, you will immediately notice other Gucci-marked exterior details aside from the material the bag is made of. The usual ones are a small rectangular leather stitched in front, a metal plaque, a leather patch or even hanging parts. These are also rich in details, where this Gucci logo font lesson is applicable. Here is a close-up photo of the rectangular leather detail for my authentic $10 Gucci messenger bag. We have the 1) trademark symbol (®), 2) the proper font for GUCCI, and 3) ‘made in italy’ in lowercase. Now, take a look at an example of a FAKE Gucci rectangular leather, with the same coated monogram canvas material. You can see the sloppy details in the lettering, the embossing was shoddily inconsistent, and the position of the ® is off-center. The example below is a “better” fake. For an untrained eye, this looks okay but if you look closely, you see the red flags. Try comparing it to the authentic one above and you will be able to make a list of your own on what makes this bad. Next, let us take a look at an authentic example of the rectangular leather tag in an authentic Gucci monogram canvas. The first below is from the popular Gucci Monogram Canvas Tote Bag with Red and Green Stripe Handle, while the second one was from a Gucci crossbody bag. Both of these are authentic leather tags. They differ in size because the first was from a large tote, while the second was from a small bag. Now, take a look at examples of rectangular tag from a fake Gucci monogram canvas bag. The details here look stupendously off. Here is a black monogram canvas version of the $10 messenger bag. You will see that they share the same detail, except of course, for the color and material. Both have the embossed line on top and the bottom, the registered trademark symbol, the GUCCI and ‘made in italy’. You can also go as far as counting the stitches, as they have 7 on each side. Also, focus on the stitching here and the other authentic examples. You will notice that the stitches are slightly slanted/diagonal. Compare it with the fake examples and a lot of them got this detail wrong. For instance, look at the fake Gucci rectangular leather here. This is also for a black monogram canvas material similar to the one directly above. By now, you will notice the wrong details in the embossing, as well as the weird stitches — some stitches are too tight, while only 1 of the 4 corners had the finishing stitch overlapping the leather. Let me indulge you with this gold monstrosity, which is an irony of its own. Look closely at the stitching and the embossing, and compare it with the authentic ones above. This is a bit tricky because, aside from the sheen of the leather, it seems like the details are okay. However, look at the ‘m‘ and ‘y‘ in ‘made in italy’. The two examples below are from an authentic nylon canvas version of that $10 Gucci bag (interesting because, at one point, I had 4 bags of the same style but with different materials). Compare it again to the examples we had above and the details are correct. Meanwhile, the one below is from a Gucci luggage made from heavy cotton canvas material. Notice the absence of embossed horizontal lines on top and bottom. 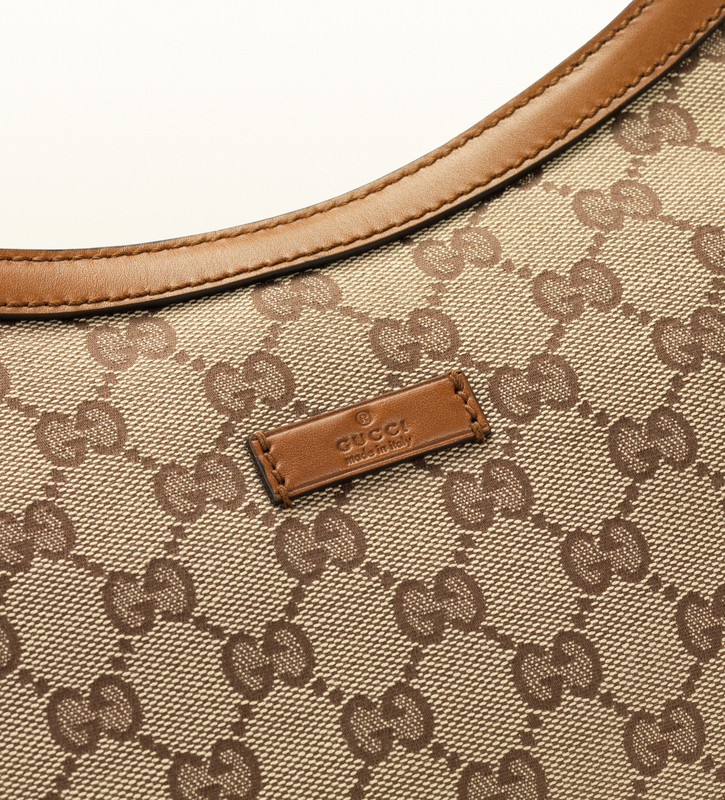 In some bags, Gucci used a metal hardware engraved with the usual details. Look at the example of a nylon canvas crossbody bag below. The next two photos are the embossing on the leather on the flap of Gucci camera bags, made from 1) monogram canvas, and 2) nylon canvas. Meanwhile, there are times when you see rectangular leather like this which (aside from the trademark symbol and GUCCI made in italy’) has a numbering below. If you look closely, the lettering is not etched. The numbering must also conform with one of the two rows in the serial number tag inside. Not all exterior details are put in a rectangle. This round leather patch is found in vintage box crossbody bag. Notice the very clear details of the lettering that conforms with the anatomy of a Gucci logo font. You can also make out the slanting stitches even with the circular shape. This authentic leather patch below also has the GG interlocking logo. In the example of a Gucci flap messenger bag, you can see the clean lines of the standard writing. These are important details to see, on top of the leather tag and serial number analysis that we did. This could help you out when looking at Gucci bags for sale online. It will also be best to bookmark this page during your next Ebay shopping. Next on the series, I will be discussing Gucci hardware. This encyclopedia is beautiful!! Thank you very much for this rich information about Gucci bags! I have read all the parts but i couldn’t find this information: About the leather tag (external) of the GG Dipped Canvas Messenger Bag with Signature Web Strap, where should it be? Is this important for checking the bag? I mean where should be the top horizontal line of the leather tag ? Does it close the whole two GG monogram letters? Or does the top line of the leather tag be over just the serifs of the Gs? Or under the serifs of the Gs? Is this ok touching or not touching the GG for authentic ones? Hi! I think this should not be a problem. There are variations on the placement of this rectangular tag. So I understand that placement of the tag also can change for the same models… Right? 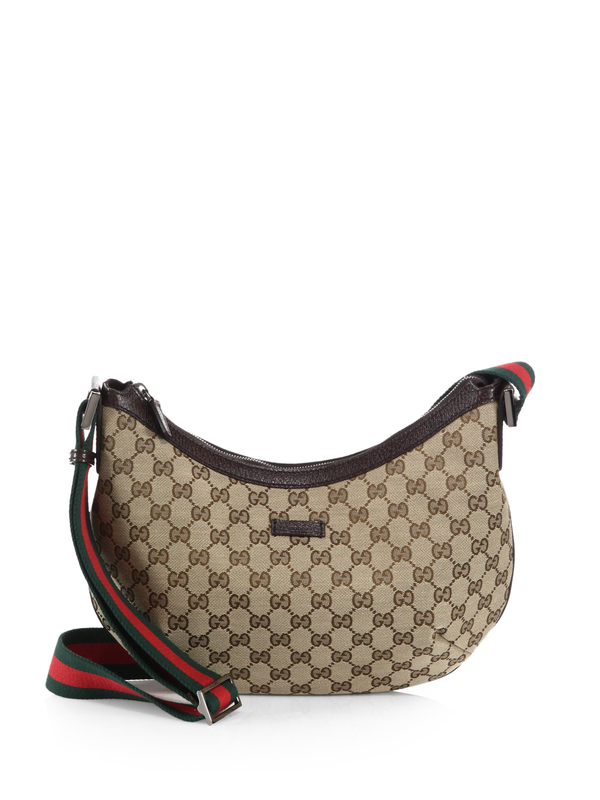 For example, different Gucci GG Dipped bags can have different placement of the tags? What do you think about the bag in the link below? It would be helpful to see the leather tag inside to be sure. I’m about to pay 200 for a Gucci bag. I was wondering if I could send you a photo so you could tell me what you think? I’m a bit overwelmned by all the small details and I am not sure if I have a winner or loser haha. Can you all help? Hi Carmen! I would be needing clear and close up photos of this Gucci Marmont (serial number and leather tag). Thanks! Hello! I want to buy the Gucci briefcase. But it seems to me that the leather stripes at the front sewed asymmetrically. Can you please help me with that? Thanks! Hi! I am inclined to think that this Gucci bag with serial number “200180 200047” is fake.